In this post, GP Dr Richard Ma, provides a lowdown on HIV testing and how increasing testing rates is the answer to ending the HIV epidemic. It is the time of year again for HIV Testing Week! 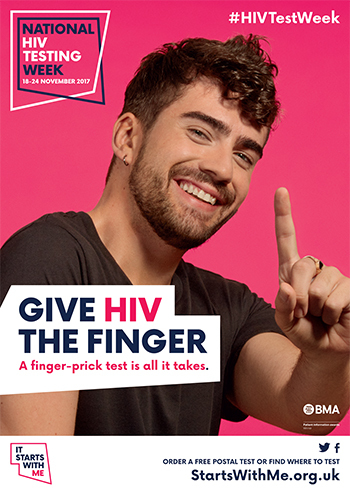 This year’s theme is ‘Give HIV the Finger’ – a cheeky reference to the free finger-prick test that people can receive by post, to provide a blood sample for testing without attending a clinic. According the latest surveillance from Public Health England (PHE), just over 5,000 people were diagnosed with HIV in 2016; this is an 18% drop compared with 2015. [i] 54% of diagnoses were among gay and bisexual men; 19% and 22% among heterosexual men and women respectively. Late diagnosis is an important predictor of morbidity and premature death in people with HIV. In 2016, 42% diagnoses were made at a late stage of infection when treatment is less effective. Some barriers still exist that stifle efforts to reduce late diagnosis. These include attitudes to risk and concerns about confidentiality, testing and HIV diagnosis from both the public and professionals, as well general stigma around HIV. 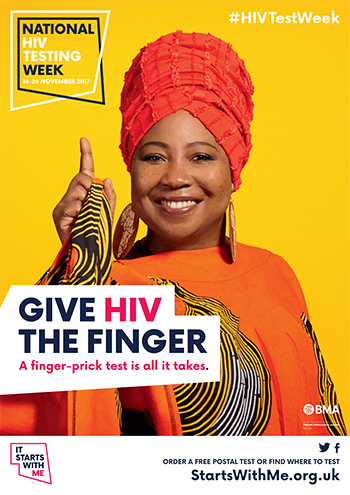 PHE, professional, and third sector organisations have produced guidelines, campaigns, and training to improve awareness of HIV testing, promote HIV testing as a positive choice, and make it easier for the public to access testing and for providers to offer tests. [x] The annual HIV Testing Week is just one example of a broader strategy to improve access and reduce the stigma of testing. What is happening during National HIV Testing Week? PHE and some local authorities have been funding an HIV postal testing scheme since 2015, targeting communities with higher prevalence of HIV such as gay and bisexual men, black Africans, and those with partners from high prevalence countries. In 2017, PHE has expanded the scheme to all areas of England. The additional tests will be available to order from now until Thursday 4 January 2018. Last year, more than 20,000 tests were ordered during HIV Testing Week and the extended promotion period with a return rate of 52%. What is the HIV postal test? HIV postal test kits, or ‘home sampling’ kits, allow people to take a finger-prick blood sample themselves at home. The samples are sent to a local laboratory for HIV testing. The test is highly accurate and can detect HIV within four weeks after infection. Home sampling tests give ‘reactive’ or ‘non-reactive’ results; reactive results are further classified into ‘high’ and ‘low’ reactive tests, the former more likely to suggest an HIV infection. The national postal testing scheme compliments existing HIV testing services; test results are managed by community-based organisations which provide further support and guidance. When I started medical school in the 1990s, HIV and AIDS almost felt like a death sentence at diagnosis. It was a troublesome time for many gay and bisexual men, as well as other high-risk communities. The era of effective ART that followed transformed the lives of many living with HIV, and the stigma attached to it. I never imagined that within a couple of decades, I would see a fall in HIV diagnoses and near-normal life expectancy for those living with HIV in the UK. I am even optimistic that we could even get close to eliminating HIV in my lifetime. However, there are still far too many new infections, too many people who are diagnosed late, and much more work with prevention and stigma that needs to be done. Let’s start to end the HIV epidemic by increasing the testing rates now! I would like to thank members of British HIV Association (BHIVA) External Relations committee for commenting on the draft. The views expressed are those of the author and not necessarily those of the NHS, the NIHR or the Department of Health. Dr Richard Ma is a GP principal in Islington and an NIHR Doctoral Research Fellow based at Imperial’s School of Public Health.